Yes please -- I love Prague and would it would be great to win my way to the Prague Main Event in December. Even better to win playing with free reload bonus cash! Intertops Poker offers regular special reload bonuses to its players – and it’s that time again this weekend. From November 9th – 12th (only), the fifteen-year-old poker site gives all players a 50% up to $300 reload on their deposits. To claim your reload bonus, just enter the reload code “RE22” after you've made your deposit. Bonuses will be immediately tagged to your account. Reload Bonus details: http://poker.intertops.eu/en/promotions/#item_1252. 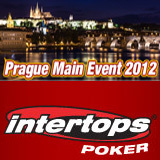 Prague Main Event 2012 satellites are running until November 18th and Intertops is guaranteeing at least one $2,700 prize package. Details are available at http://poker.intertops.eu/en/promotions/#item_1818. 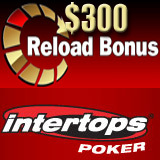 Complete details of Intertops Poker’s $300 Reload Bonus and other nice promotions are available at http://poker.intertops.eu/en/promotions/.